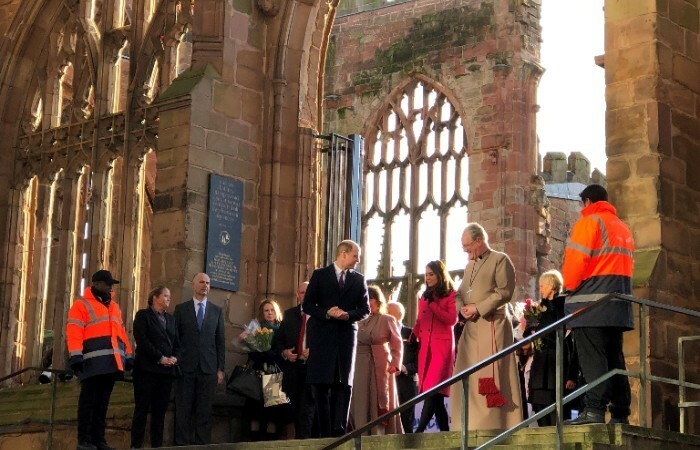 The Duke and Duchess of Cambridge were welcomed to Coventry by the crowds in the Cathedral Ruins as part of a special visit that gained the city national attention. The Royal couple began their visit with a tour of Coventry Cathedral, then they opened the new Science and Health Building at Coventry University and ended their day at the Positive Youth Foundation. On arrival their Royal Highnesses chatted to well-wishers and schoolchildren gathered in the grounds of the Ruins before convening at the altar to hear Canon Sarah Hills tell the story of the destruction of the Cathedral in the 1940 Blitz. They heard more about the Cathedral’s Reconciliation Ministry and the Community of the Cross of Nails, met with members of the Cathedral choir and saw an oil painting by Fred Roe of George VI’s visit to the Cathedral Ruins a couple of days after the bombing in 1940. Their Royal Highnesses ended their time at Coventry Cathedral at Rising Cafe, a social enterprise cafe run by independent Christian charity, Betel. The Royal couple were then given a grand tour of the new Science and Health Building at Coventry University where they observed students tend to a patient in a replica Ambulance, visited two clinical wards and watched students within the mock surgical theatre. Their final stop was with the Positive Youth Foundation where Kate spoke to teenagers about the effects of mental health on their lives, whilst William watched fitness regimes in the dedicated sports area.